KATHMANDU, Jan 28: Nepal Stock Exchange (Nepse) benchmark index nosedived 90.7 points this week to close at 1,375.14 points on Thursday - the last trading day of the week. The benchmark index fell below the 1,400-mark this week as bank and financial institutions (BFIs) are tightening their stock financing due to liquidity crunch. While credits toward stock market has stopped, many investors are also getting margin calls for the loans they have borrowed from the BFIs as the share price is going down, according to observers. Many risk-averse investors are also finding 12 percent of fixed deposit interest rates offered by many BFIs lucrative compared to low returns from the stock market. The stock market has been on a bearish trend since November last year mainly due to liquidity problem in the banking system. Liquidity-strapped BFIs are now offering up to 12 percent interest on fixed deposit as they are facing shortage of funds to extend loans. Cheaper finances from the BFIs as well as stock dividend amid pressure to increase paid-up capital had lifted the stock market to a new high of 1,881.45 points on July 20 last year. However, stocks have started to retreat as interest rates are rising in a rapid way, setting off selling pressure in the market. “With interest rates rising, many investors are offloading their holding. There is always reverse relation between interest rates and stock prices. So, the market is on a bearish mode now,” Gunanidhi Bhusal, managing director of Aryatara Investment and Securities Pvt Ltd, told Republica. He also pointed out the rise in the supplies of shares to the decline in the stock prices. “There have been very good stock dividend offers last year. Many BFIs are floating rights issue. It does not take much time now to get listed in the market and investors can also immediately sell those stocks. 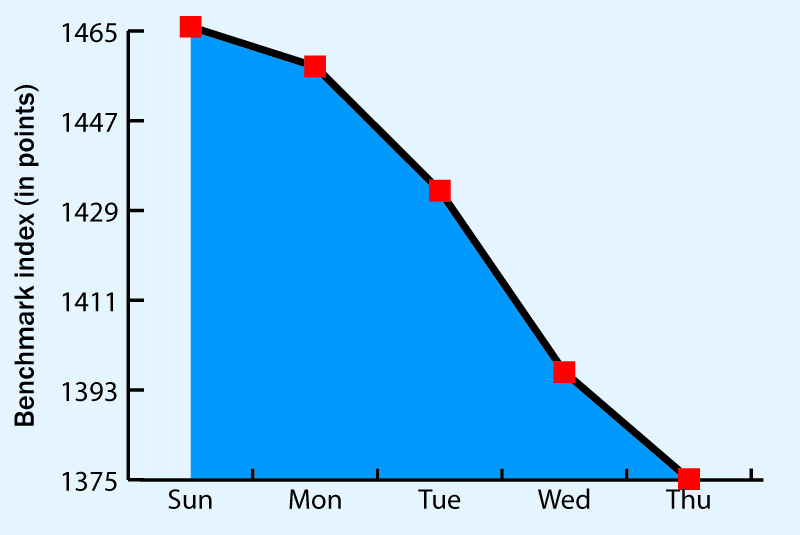 The price is falling also due to rise in supply and subdued demand,” he added. All trading groups, except Manufacturing and Processing, logged loss this week. 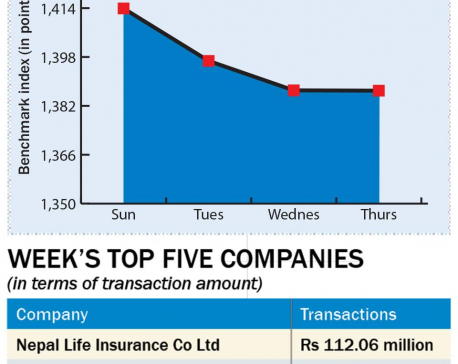 Insurance group was the biggest loser of the week as its sub-index dipped 575.78 points to close at 6,283.79 points. Banking, the heavyweight group in the secondary market, also shed 94.02 points to settle at 1,308.54 points. Hotels group also ended 93.86 points lower at 1,775.32 points. The sub-indices of Hydropower and Development Bank also fell 88.01 points and 74.35 points, respectively, to close at 1,620.92 points and 1,438.56 points. Finance group and 'Others' group also plunged 45.12 points and 26.6 points to end the week at 655.22 points and 703.67 points, respectively. 'Trading' group remained unchanged at 206.16 points. 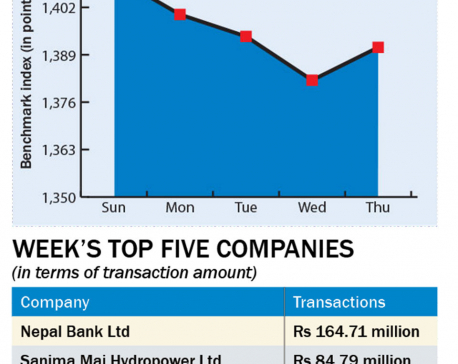 A total of 6.67 million units shares of 155 companies worth Rs 2.23 billion were traded in the market this week through 19,360 transactions. 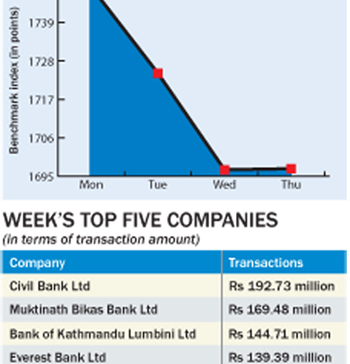 While bankers are ruing shortage of loan-able funds due to slow growth in deposits, Securities Board of Nepal (Sebon) has scrapped a rule that required the money collected in the initial public offering (IPO) or follow-up public offering (FPO) to be parked at the Nepal Rastra Bank (NRB) for a certain period of time. The decision comes in the wake of liquidity shortage in the banking system which has crippled the capacity of the BFIs to float loans to borrowers. “The rule has been scrapped because there are complaints of liquidity shortage in the market which was also affecting the secondary market. Also the requirement is soon becoming redundant due to implementation of Applications Supported by Blocked Amount (ASBA) system,” Niranjaya Ghimire, deputy spokesperson of the Sebon, said. Earlier, issue manager of any IPO or FPO was required to deposit all the money collected in the process at its account in the NRB within six days of closing of the issuance for at least six days. 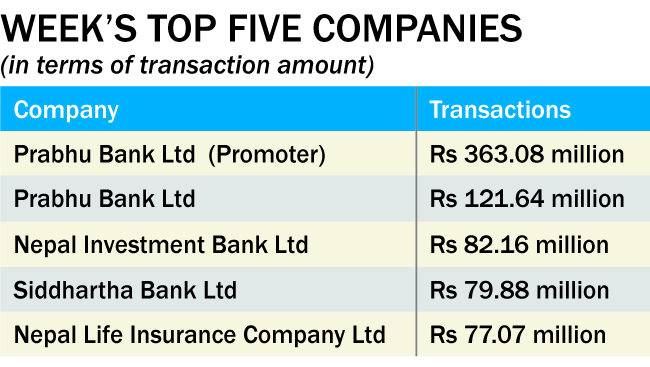 Such requirement had also worsened the bank's liquidity position as huge fund, like Rs 52 billion of money collected from the FPO of Nepal Life Insurance Company Ltd, gets stuck in the central bank's vault. With FPOs of some other big companies in pipeline, bankers had worried that more funds would end up at central bank's vault, worsening their liquidity problem. Bankers say the scrapping of rule will provide some respite to them.